This page is a translated version of the page Columbus and the translation is 100% complete. Columbus was founded in 1918 and was one of the first manufacturers of fountain pens born in Italy. The Columbus pens, like many other similar productions in Italy, were imitations of the models produced by the most famous American companies; however, they were of good quality, and of excellent stylistic realization, which makes the company one of the most significant on the Italian scene. On May 19, 1918 the Eugenio and Alfredo Verga brothers founded in Milan the Alfredo Verga dei Fratelli Verga Snc,, with headquarters in Corso di Porta Romana n.80. Alfredo Verga already worked as a trader for Conway Stewart, while Eugenio Verga was a salesman for the Uhlmann's Eterno. The purpose of the new company was to enter the market with production and sales of fountain pens, nibs, ink and stationery. Eugenio chose the name of their products, Columbus, while Alfredo gave the company his name; the same year the first fountain pen, called Columbus Safety Pen nr. 1, was produced. The first models were black hard rubber safety pens, produced in six different sizes from 1 to 6, and in long or short version. Their style was a imitation of that one used by German producers (like Montblanc or Kaweco) with rounded cap top and barrel end. These pens were in fact produced with all the external components purchased in Germany, while just the internal mechanism, the assembly and the finishing was made in Italy. Like other Italian pens of the same period, Columbus pens were imitations of the most famous models at that time, but they were produced locally so they could be sold at much lower prices. Most of the Columbus initial production consisted in safety pens with gold plated (both 14k or 18k) overlays. The pens had good technical quality, and their decorations were very sophisticated, by far the best of that time and significantly better than those of the foreign models they imitated. The activity was quite successful and in 1924 the Columbus trademark was officially recorded at Reg. Gen. N. 26261 at the department of the economy. After this date the pens started reporting an extended imprint (compared to the previous one havin only the Columbus name) bearing the registration number and the words sicurezza garatita. At the same time the company expanded its production by introducing new versions of gold-plated overlays pens. In this period, placed in the first half of '20s, there was also a change of style, passing from the imitation of Germans model to the American ones. The change is shown by some as a consequence of birth, in 1927, the new Columbus Eugenio Verga, but there are clear references to pens with this style produced before the separation of Verga brothers, and in this catalog before the division they appear together. In the first half of '20s the Columbus 670 model, very similar to Waterman 42, was introduced. It was produced in three size, normal, thin, and ladies, and in black, red or mottled hard rubber. The range of available overlays was also expanded, and to the simple machine engraving were added decorations or bas gallery and this kind of work became one of the strengths of the company, so that they sold also Waterman and Montblanc pens with their overlays. There is a remarkable production of this pen with an engraving of the David star on the body of the pen (also listed on the packaging) as a result of an agreement between Columbus and the Milan ghetto. The same symbol appears in other models. In 1927, when the safety hard rubber models were too old, the company faced a crisis and broke up. The two brothers separated, Alfredo Verga founded its own company, the Omega A.V.M. while Eugenio Verga, owning of the Columbus trademark, continued alone creating a personal company with its own name. While maintaining previous models production the new Columbus began to put attention in to technical innovations. A new double channel feeder, used on top line models until the 40s, was created, and the company began testing the use of celluloid. The company tried to position themselves on the market aiming to produce pens which were generally of good quality but sold at the lowest prices possible. In 1929 a new filling system was patented (on the mechanism is imprinted the nº IT-268327, not present in any archive, but the nº GB-334913 is present), essentially an own version of the spoon filler. This patent also has a very interesting story, there is in fact a variant of 1931, the nº CA-327288, that's assigned to the Mabie Todd company, that in that period was about to launch its leverless filler, which creates an unexpected link between these two companies. Also in 1929 the Columbus Extra line was introduced, using the new filling system. Since then the name Columbus Extra was used to indicate the high-end production, so under this name were produced a wide variety of different models. Typically all models were further identified by a numerical or literal code. This line, with the same name and the same model numbers, remained in production for about a decade, while undergoing many stylistic and technical changes. Therefore is very difficult to classify with the same name a production that can be highly differentiated. The pens of the first Columbus Extra line were Flat tops, clear imitation of the Parker Duofold; they were produced in four versions numbered 98, 96, 94 and 80, the first three respectively corresponding to large, medium and small size, and the forth to a lady version (same size of the small, but with cap ring instead of clip). In 1931 the Columbus Extra underwent a restyling following the trend of streamlined shapes, and the cap was decorated with a different cap band. The pens of this period, however, although it were obvious imitations, were of good quality and very elegant. The 98 model remains one of the best pens made at that time. Around the 1935 a new faceted Columbus Extra was introduced. 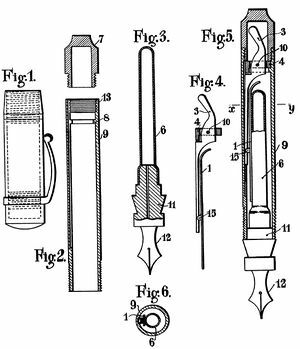 The pen was a lever filler, and remained in production until the late '30s. The pen was produced in three sizes, large, medium and small, identified by their initials as Columbus Extra G, Columbus Extra M e Columbus Extra P. It was produced in two version, with three rings or with a greek motif decorated band. The pen was a lever filler, with a wheel clip, similar to the one used on the Doric, and virtually identical to the one used on the same name model produced by Omas. Also around 1935 the Columbus introduced a new arrow clip, an obvious imitation of the one used by Parker on the Vacumatic model. The new clip was progressively used on many different models, but it was applied primarily on the top models marked Extra. Around 1936, as a result of the good commercial success achieved by its pens, Columbus moved its activities into the new headquarters of Via Lamarmora in Milan, where more space allowed to meet the increased production needs. In addition to the top line of the various series marked Columbus Extra the company also produced lower price pens simply marked as Columbus, also identified by a numerical code. In the production of the second half of the '30s stand out among these the 30 and Columbus 55 lines. Around 1940, even if there is who gives the origins to the second half of the '30s, the Columbus 25 was introduced to a compact pen with a stylized spear-shaped clip using a button filler system. Although not marked as top line, the pen was provided with very elegant band decorations on the cap, similar to those found on the top models of the Columbus Extra series. 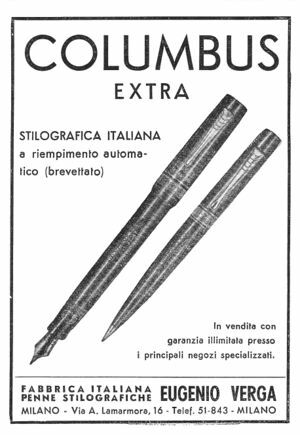 Also in the second half of the '30s, according to the new trend inaugurated by Vacumatic, Columbus started producing models with transparent celluloid that allowed to see the ink level. In this same period there was the birth of the Columbus 112, a plunger filler model. In 1938 the company obtained a patent for a screw piston filler, which had as a consequence the creation of the 100 line, equipped with a piston filler. During the period between the late '30s and the beginning of the '40s, the company was affected, as for all other European producers, by the effects of the war, and because of the economic difficulties and the supply shortage a drastic simplification of production was made, using only button filler and arrow clip on all models. In 1941 the company launched a model produced exclusively for the army, the Columbus 29 that after was also distributed on the overall market. In 1942, during a bombing, the factory in Milan on Via Lamarmora was almost completely destroyed,, and the production was moved to Lesa, on the shores of Maggiore Lake, with considerable logistical difficulties since the plants were in four different sheds, quite distant from each other. In this period the company merely continued a limited production of existing models without any change or innovation and only in 1946, when the company was able to return to Milan, the production was resumed at full capacity. In the middle of '40s Columbus introduces the 134 model, a big lever filler pen that was a clear imitation of the Eversharp Skyline. The same model was also produced in the 132 medium size version and in the 130 small version, for ladies. Again in the '40s a piston filler model, the 40, was also produced and the 55 had a restyling, becoming a whole line of pens. In the '50s, following the market trends set by Parker with the success of the 51, Columbus introduced the 70, an hooded nib model. In this case however the pen was not just an imitation: it was made in celluloid and used a piston filler, it also had a screw cap, and the nib was only partially covered to allow the us of a flexible nib. Like other Italian imitations of the 51, such as the Aurora 88 or the Omas 361 the pen is probably more interesting than the original. The last series produced in celluloid, the Columbus 90, was introduced approximately in 1951, and was made both with a piston filler or with a special button filler with the back knob not removable, very similar to the Montblanc push-knob. The production of the '50s saw the abandonment of celluloid for the use of cheaper molded plastic, and the production of hooded nib models and other cheap plastic pens for the student market. In 1957 the founder died, leaving the company in the hands of his son Enrico, but at that time the fountain pen market was drastically shrinking due to the spread of the ballpoint pens. The choice was towards the production for the school and the low end of the market, but the company suffered an inexorable decline. In 1992 the company renmants and the Columbus trademark were sold to Santara Srl that is still producing some modern pens under the same brand. ↑ meaning Alfredo Verga Society of the Verga Brothers. ↑ Letizia Jacopini reports on "The history of the fountain in Italy," the number 23247,seen in many pens, which presumably refers to the fact that the mark is registered in Vol. 247, Ranked #23 in the register of trade marks. ↑ on the historic section on the company site the Columbus 670 is dated to 1924, and there is a commercial letter from 1926 were such models are shown. ↑ as shown in this catalog. ↑ from the italian "Grande" (big), Media (medium) and "Piccola" (small). 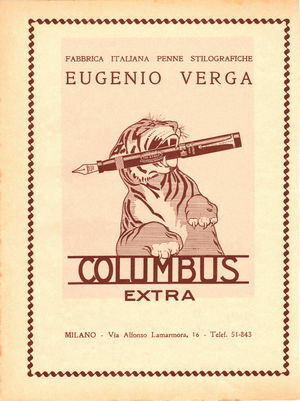 ↑ although there are no specific documentary references, is a known fact that Eugenio Verga knew and had friendly relations with Armando Simoni; the pens produced by Columbus and Omas have in many cases, materials and finishes virtually identical and because this many conjectures have been made, such as the fact that Omas may have produced for some times some Columbus models, or that the two companies have made joint purchases from the same suppliers. ↑ according to Letizia Jacopini, but this 1935 advertisement is already reporting the new location. ↑ Letizia Jacopini in his book report it as n° 288327, but this number is too similar to the previous one, nº IT-268327, date ten years befor, and this make that number dubious; the only one other known patent is nº IT-102094, found on hooded nib models produced after WWII and marked Columbus Extra 148 and Columbus Extra 150. ↑ this is also why there are strong uncertainties on many dates, because all the archives were lost in that occasion.